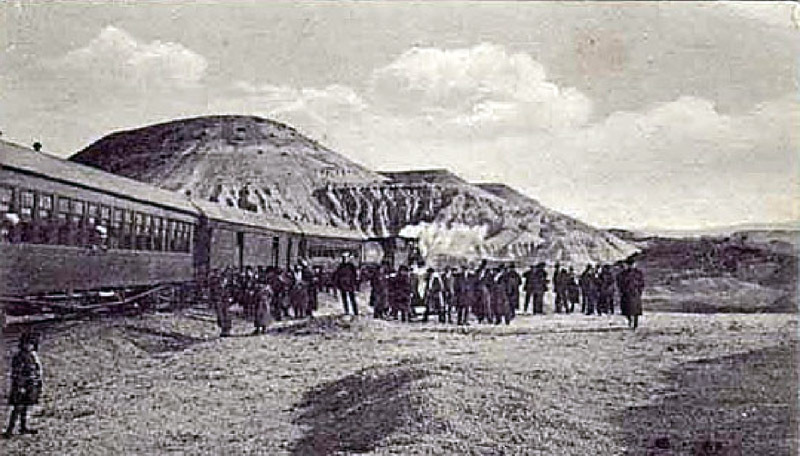 The line ran through the same arid landscape as the other broad gauge lines, and was built by the 'Ministerio de Obras Públicas' under the same 'Ferrocarriles de Fomento' law. It did however, serve a slightly higher population density than the other two lines, and in addition was centred on the oilfields around Comodoro Rivadavia. At the beginning of the 20th century there had been no settlement at all at the coast, though Commodore Martín Rivadavia had anchored there in 1890 to explore the area. It was the agriculture of Colonia Sarmiento and the area around the lakes which required a small port and warehouses to aid the movement of produce to the north. 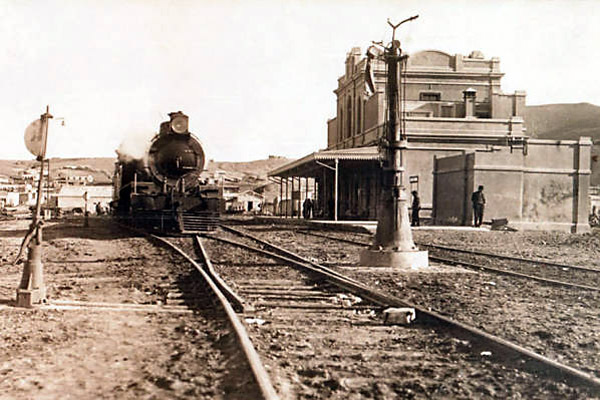 By 1901 the first buildings had been erected and a proposal had been aired for a railway line from Rada Tilly (south of Comodoro Rivadavia) via Colonia Sarmiento to Colonia San Martín. Whilst Arturo Calman had obtained authorisation for this, it was never actually constructed (1). The town also received Afrikaaner migrants seeking a new start after the 'boer' republics were absorbed into the new Union of South Africa. 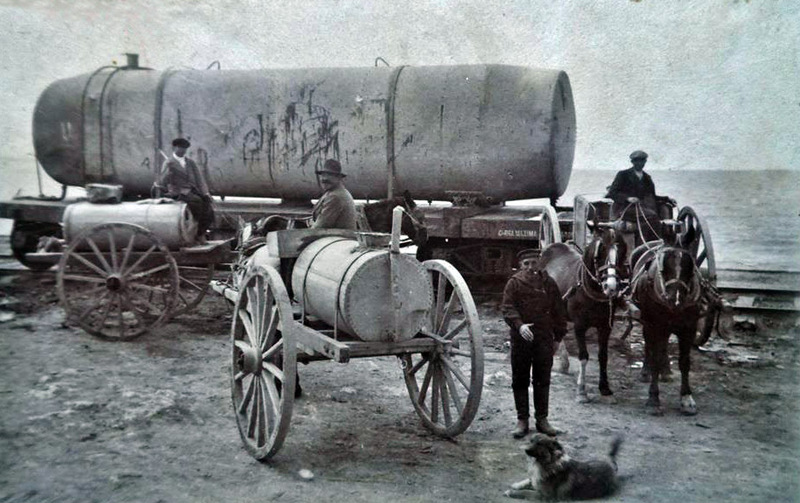 In 1907 oil was discovered and the growth of the town was assured. A new railway route was surveyed in 1908 and was originally intended to form part of a single network with the other lines. Approval for the first 104km. from the coast was given on June 17 1910, at an anticipated cost of 25,300 gold pesos per km. The first materials reached Comodoro Rivadavia aboard the steamer Mendoza in April 1910 and gangs of Russians, Spaniards, Poles, Bulgarians, and others were set to work, presumably organised by languages for ease of command. The various laws and decrees which paved the way for the line to Colonia Sarmiento. Early days at the coast (2). The Maciel muelle is under construction and there appear to be piles of materials. Whether the oil drums were brought in to provide fuel, or were early samples of the area's main export, is not clear. This muelle was eventually strongly reinforced and it lasted at least until the building of the new harbour in the late 1920s. A poor photo but showing the celebratory initial train on the first few kilometres of track. By 1911 the first 112 km to Cañadon Lagarto was in operation. 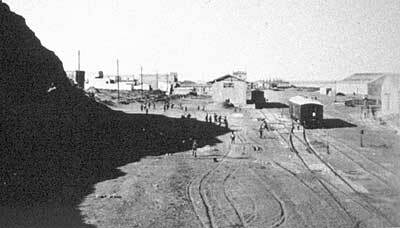 Work reached Colonia Sarmiento by 1914 and was halted there pending the ending of the war and easier economic times. By the 1920s, as explained elsewhere, the plans had been revised and links to the Las Heras line and north-west towards Trevelin were now to be of 75cm. gauge. In the event, not even this was done and the railway ran on in isolation for the next sixty years. Save the file to your desktop and double-click to decompress it. Open the folder and drag the KMZ file onto Google Earth's Places palette. You will now find that you have placemarks for each of the main locations along the route, and two paths to enable you to 'fly through' the route as if in a helicopter. Select one of these and click on the start button to commence the flight. • Línea Com. Rivadavia a Sarmiento A flight along the mainline from Comodoro Rivadavia to Colonia Sarmiento. • CRAstrabranchroute A flight from Empalme Astra along the branch to Astra north of Comodoro Rivadavia. 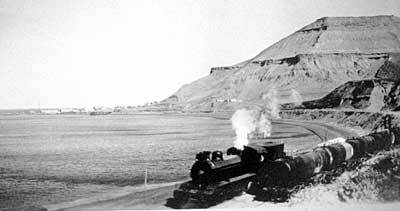 The main broad gauge line began from the main terminal station next to the small town of Comodoro Rivadavia. Whilst the picture below shows the station in grand isolation between the town and the sea, the situation soon changed. 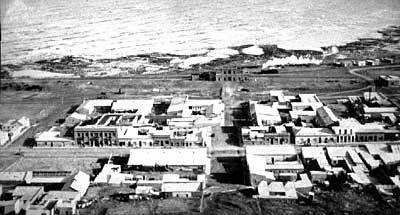 As oil money flowed in and the town grew in its cramped site between Cerro Chenque and the sea, not only was the station soon surrounded but new land reclaimed from the beach as described in Chapter seven. The station building, seen above next to the sea at the foot of the street in front of the camera, is shown in close-up below. Over the years the station gained a platform canopy and a few extra rooms. The building survived the closure and saw a number of community uses but was later (2001) restored. The photo below was taken after some of the later additions had just been removed. Note the water tower still surviving at the far end of what was the platform. From the opposite end, the picture below shows the station in operation. 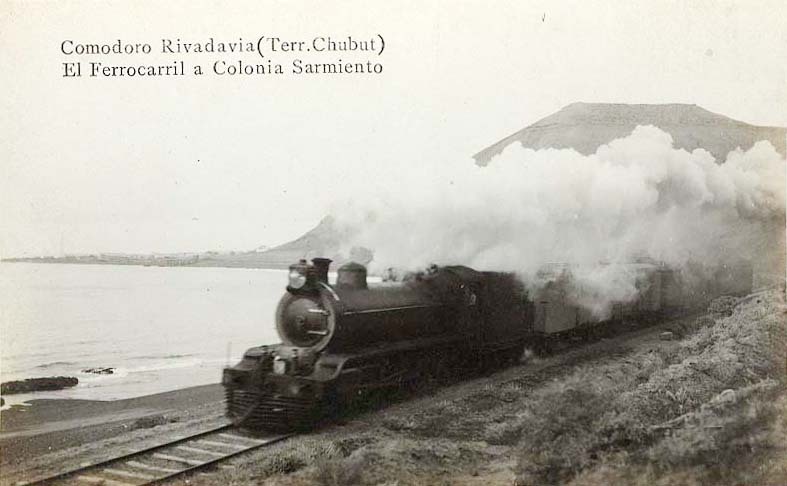 The photo below illustrates Comodoro Rivadavia station from the west end early in the life of the railway. 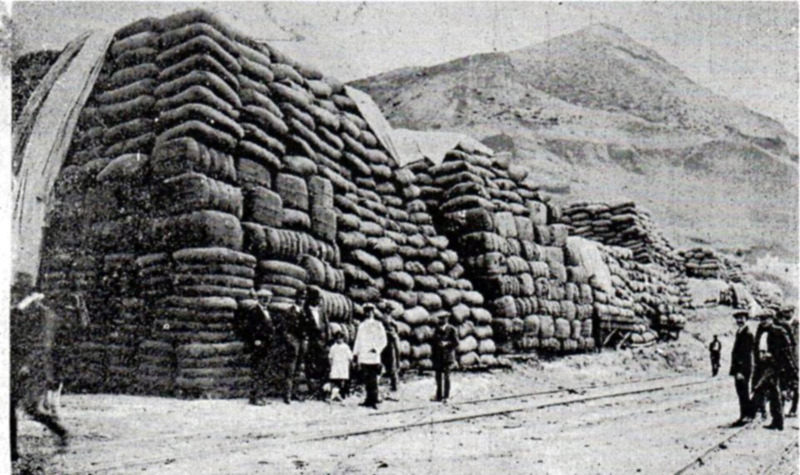 Found on FaceBook was this view of bales of wool stacked sky-high and covered with tarpaulins in the shadow of Cerro Chenque, awaiting a steamer to take them north. This view was found for sale on Mercado Libre. 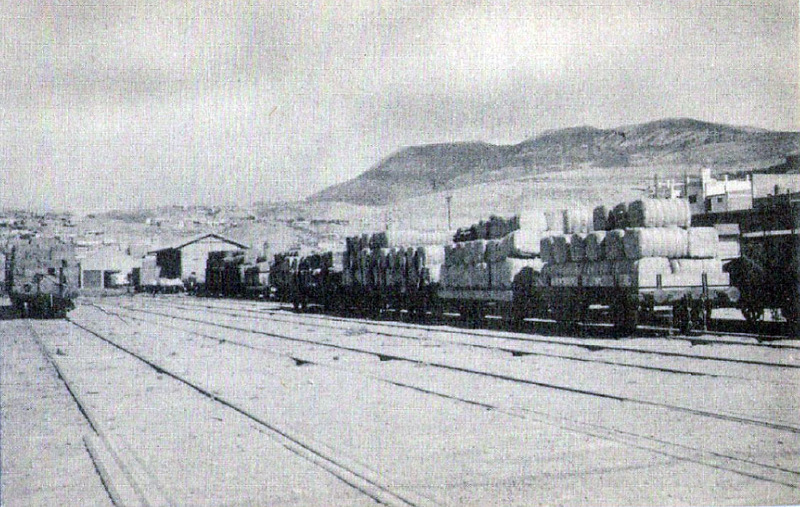 Interestingly it shows two four-wheel flat wagons loaded with bales of wool. On the south side of the station yard just west of the main buildings lay the turntable. 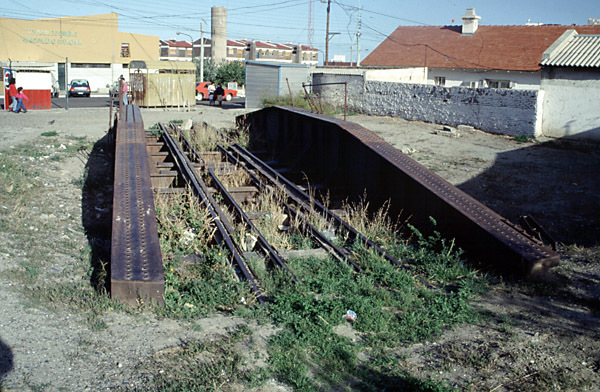 This was unusual in being of dual gauge, with an inner set of rails for the 75cm gauge Baldwins of the Ministerio de Obras Públicas' Rada Tilly line. See the Comodoro Rivadavia page in Chapter 7 for details of this line. The above photo shows the turntable resting in less than splendid isolation in 1992 (3). At one time the intention was that it should be preserved but whether it has survived the creation of the new bus station on the station yard site is not clear. Immediately east of the station was the new 1928 muelle and harbour. The construction works for this are covered mostly in Chapter six. The port eventually had its own locos and rolling stock, mentioned on the next page. 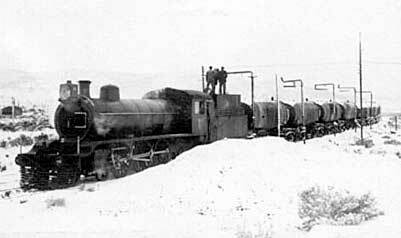 There were also 75cm gauge tracks at this location, between the workshops at Km 5 and Rada Tilly away to the south. 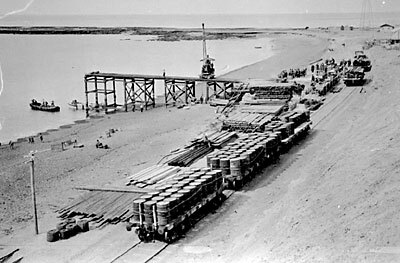 In this view, taken in February 1943, the giant hammerhead crane is unloading broad gauge platform wagons from a lighter. Smaller mobile steam cranes and a port loco are a little further back. The 75cm. gauge tracks are also visible. In the far distance Cerro Chenque rises above the town. The broad gauge after leaving the station immediately turns north along the narrow coastal strip below the hills. 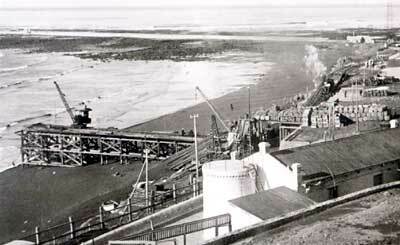 Above is the early Maciel muelle that was shown under construction in an earlier picture. By now a number of buildings have grown up around it, but there is still no sign of any harbour works in the background so the date must be before the mid 1920s. The smaller stations were by no means as solidly built as the main terminus. Below is the building at Km. 5, though taken after the tracks had been lifted. At Km 5 were the main loco depot and workshops. 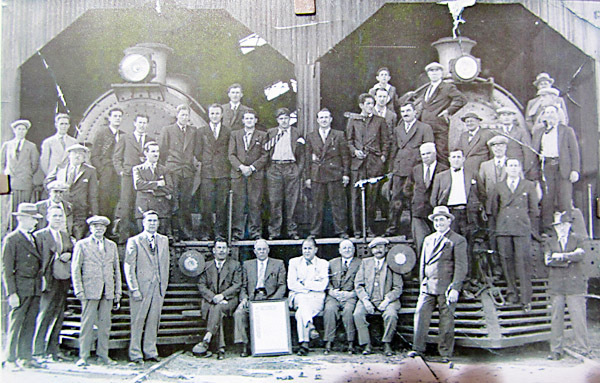 This photo shows the front of the two road running shed with management and staff standing in front of a pair of pacifics sometime in the 1940s. A passenger train near Km 5. 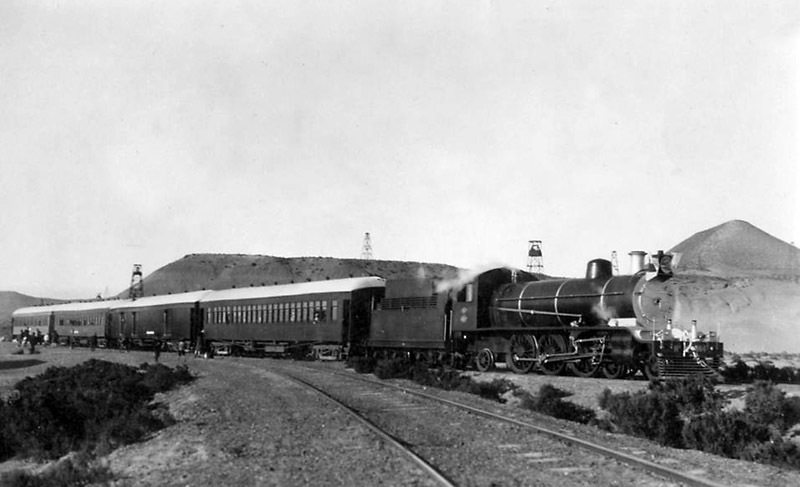 A passenger train with the same engine and formation as the previous at an unknown location; the engine appears to be garlanded. It is not known if this was the regular train formation at that time or whether it was specially made up for some occasion. Eventually short branches were built from Km. 8, Empalme Astra, to access the oilfields at Astra and at Comferpet. The latter name is an abbreviation of the developing company 'COMpanía FERrocarrilera y PETroleo'. A large scale map of Comodoro Rivadavia is in an appendix page. A pacific, the mainstay of the line's power, waits at Astra for a train of oil tanks to be loaded. Judging by the men on the tender top it appears that the loco is also taking on fuel. After Empalme Astra the mainline turns inland past the aerodrome and eventually leaves the oilfields behind. The countryside is somewhat more undulating than that on the other broad gauge lines and by Holdich station, 31.7km. from the coast, the rails are 2,474ft. above sea level. Click to move to an itinerary of the places and features on the line. The maximum grade is of 2% (1 in 50) near Km. 112. The enamelled name-plate from Escalante station, now preserved in the Museo Ferroportuario in Comodoro Rivadavia's old station. 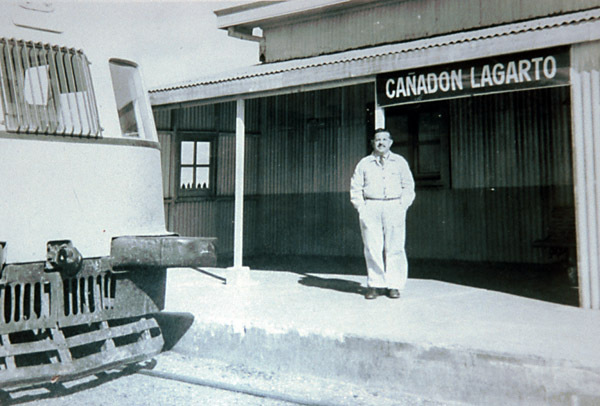 The driver of a Ganz railcar poses at Cañadón Lagarto station. The rails were of 31 or 37 kg, per m, laid on wooden sleepers with mostly gravel or earth ballast. There were nine bridges, of up to 20m. length. Like the other lines, water for locomotive and other purposes had to be raised from underground using windpumps. An early train, perhaps even a first one, certainly in the days when a full loco-hauled rake of cars was anticipated to be needed for the traffic (7). The large crowd out in the middle of nowhere does seem to suggest that this was a special occasion. Visitors in the summer, seeing the hot dry windy plains of Patagonia, rarely consider what conditions can be like in winter. These two photos illustrate what the railway had to cope with. The upper picture taken in the 1930s shows a pacific on a newly cleared piece of line, whilst the lower shot, from the '50s or '60s shows a more difficult situation. Both photos were taken near Pampa de Castillo. Note the big square kerosene headlamp in the earlier picture, replaced by an electric lamp in the later one. 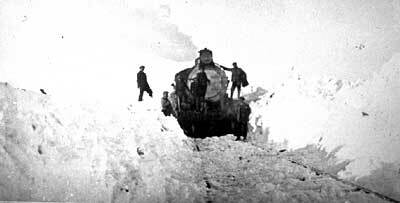 The line reached Sarmiento between Lakes Colhue Huapi and Musters in 1914. Whilst construction was abandoned at that point, it was fortunate that the terminus was in a productive agricultural area. That, combined with the demands of Comodoro Rivadavia as a market, ensured that there was rather more general traffic on offer than in the case of the Pto. Deseado railway. The station building at Col. Sarmiento, pictured in 1992 by Bernhard Stöckhert. Unfortunately it was burnt to the ground in 1994. Other photos of this station are set out in an appendix page. It should be noted that, whilst oil remained the major freight, it was only carried for short distances, the oil wells being close to the coast. This also applies to the figures in the following table, showing passenger numbers and goods tonnages annually from 1916 to 1942. The vast majority of passengers travelled within the Comodoro Rivadavia suburban area, out as far as Escalante (Km.36). The passenger figures from 1935 onwards include the new suburban service operated by coches motor. The earliest available timetable for the line is that for 1928. 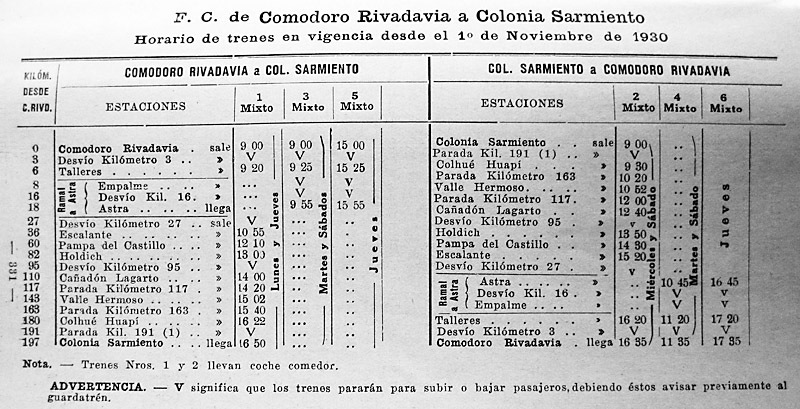 At this time there was a twice weekly mixed train, on Mondays and Thursdays towards Colonia Sarmiento and on Wednesdays and Saturdays in the return direction. 7 hrs. 50mins was the journey time in the uphill direction, and 7hrs. 35mins. downhill. At this stage there was not yet any suburban service around Comodoro, and the only additional local trains were those placing the otherwise empty stock from the Talleres at Km. 5 to the main C. R. station ready for the departure to Sarmiento, and the corresponding journeys back to Talleres after the arrivals from Sarmiento. The working timetable (itinerario) for 1946 has been studied and also the passenger timetable for late 1955. The 1946 times show a daily coche motor all the way to Sarmiento every evening (returning the following morning) and a thrice weekly freight. 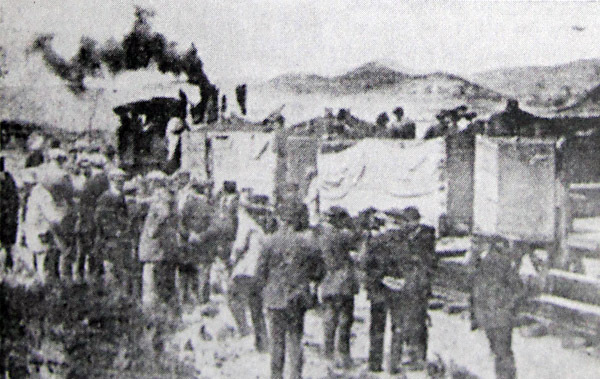 On the other hand the coche motores were kept busy within the environs of Comodoro Rivadavia as there were twenty-one daily suburban departures, of which eight terminated at Talleres (Km. 5), eight covered the Comferpet and Astra branches, and the remaining five carried on up the mainline as far as Escalante. By 1955 an extra mainline coche motor had been added, three mornings a week. The suburban service had been adjusted, with now eighteen departures from Comodoro Rivadavia each day, five to Talleres, seven up the branches, and six terminating at Km. 27, not as previously at Escalante (Km. 36). The branches were worked together in both 1946 and 1955, with trains from C. R. to Astra or vice-versa making a detour for the four minute journey to Comferpet and reversing before continuing to their destination. The suburban departures seem irregular, ususually including several between 1 and 3am. However, the pattern was presumably dependent on shift patterns in the oilfields. The line became part of the FC Patagónico in 1948. By then the railway had slipped into something of a dream world along with the other Patagonian lines. As nationalised businesses they went through the motions of seeking extra traffic and muttering about coordination with the shipping services, but all the time they must have known that they were over-manned, under-funded, and increasingly irrelevant to the majority of customers who sent their goods by road. Señor Sergio Barral has very kindly copied a lage number of tickets from his collection. These are displayed on an appendix page, accessible from here. Around 1957 the FC General Roca took on the operation of these lines. A report prepared by the Traffic Superintendent at Puerto Madryn at the time makes fairly depressing reading. He was certainly of the opinion that only the construction of the north-south 'Trans-Patagonian' railway could change the situation. FCP working timetable instructions 1960 are also attached as an appendix. They give a good deal of detail about the operation of the line. The World of South American Steam, published in 1973, suggested that all passenger services were then worked by railcars, with freight services operating perhaps twice a week. By 1975 it was clear that steam was only operating about once a week when a ship arrived. Loco no. 362 was the only regularly used engine at that time (5). Nevertheless there were still 120 employees on this railway! The line was eventually closed in December 1979. One indirect source suggests that the railcars worked the Astra branch for a short while after the main closure. The track was left for some years but was lifted in the early 1990s. One bridge span has since been taken south for use on the new RFIRT branch to Punta Loyola. One of the harbour tank engines is on static display at the old C. Rivadavia station together with a passenger coach. Señor Marcelo Arcas visited the line during its last days. He has recorded his experience on a web page (5A). Click here to visit this page. 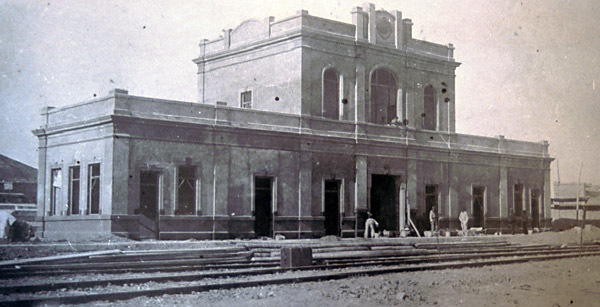 The main station building in Comodoro Rivadavia exists and has been restored. 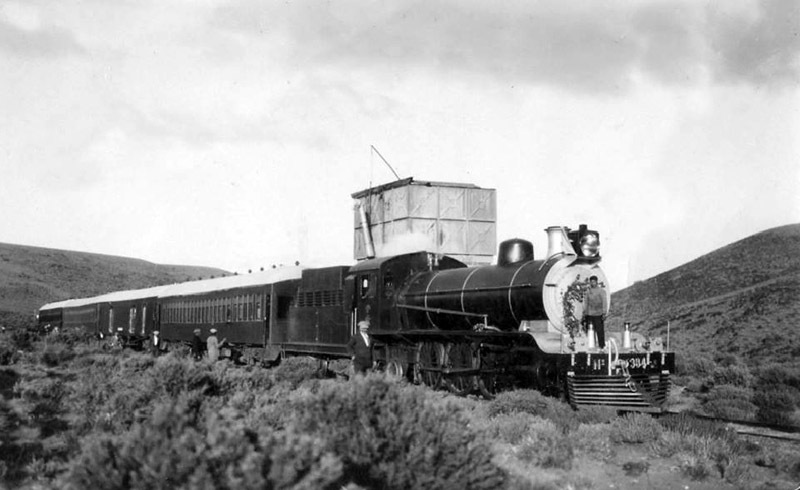 The mixed gauge turntable may also survive as a monument to the 1953 disaster on the 75cm line to Rada Tilly. The stations at Escalante, Pampa de Castillo,Km 11 and Colhue Huapi were reported intact in 1997, whilst those at Km 96, Cañadon Lagarto, Valle Hermoso and Km 162/3 (Enrique Hermitte) were not so lucky (6). 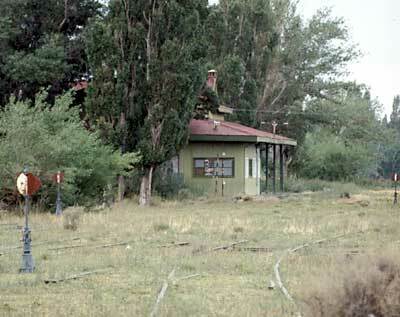 Sarmiento station was destroyed by fire in 1994. Whilst the best photos have been displayed on this page or on the following locos and stock page, additional ones are set out on an appendix page for anyone with a special interest in the line. 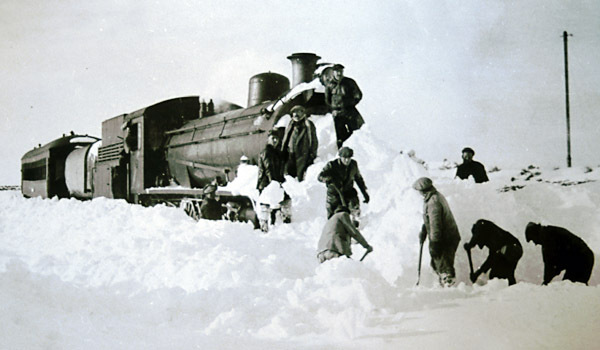 At present these include two illustrations of the main terminus station, a modern shot of one of the steam cranes from the muelles, and two more pictures in the snow out at Pampa del Castillo. 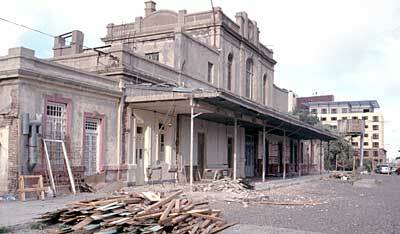 There also two photos of Sarmiento station after closure. Click here to move to that appendix page. 2 Photo by courtesy of the Archivo General de la Nación, Buenos Aires. 2A Found on Facebook, Comodoro Rivadavia (2/5/16, no longer available). 3 Photo by Bernhard Stöckert, 1992. 4 The Railways of South America - Part 1 Argentina . 1926. W. Rodney Long. 5 Visit by author in March 1975. 5A Comodoro Rivadavia, its Drewry railcars and much else. Marcelo Arcas. <www.rumbosalsud.com.ar/l-comodoro.htm>. 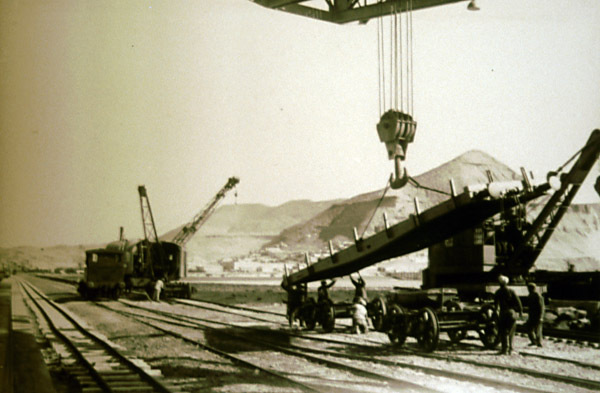 6 Unpublished report on the preservation of railway relics including the turntable at Comodoro Rivadavia. 1997. Grupo Fiel Michai, Curso de Guias de Turismo, C. Rivadavia. 7 Photos found in the Dickinson College Patagonian Mosaic online archive.